This week I was lucky enough to hear Janine Booth talk about Autism and employment. Janine found out she had autism when she was in her 40s. She describes the experience as being like someone who, having spent a life time in a darkened room, is entering into bright light. She’s a political activist and has been working for many years to improve working lives for people who are on the autistic spectrum. The National Autistic Society estimates that only 15% of adults with autism are currently in work. This needs to change! As a parent of a teenager with autism I want to be confident that his autism won’t hold him back once he starts looking for work in a few years time. Janine described some of the problems encountered by autistic adults looking for work and also suggested ways employers could make reasonable adjustments to work schedules and environments to accommodate autistic workers. If you are an employer do you advertise jobs asking for people who are excellent communicators and good team players? If these skills are not essential requirements for the particular position, did you realise that you may be discriminating against some perfectly capable autistic people? In interviews are you looking for people who communicate well or people who have the right skills for the job? These two things may be mutually exclusive for some job roles. An autistic person may not use eye contact and body language in the same way you do. They may take language more literally and fail to pick up if you are hinting rather than asking them a direct question. Interviews may not go as you expect but this does not necessarily mean that you have a poor candidate before you. So if you ask; “Can you tell me how you found your previous job?” and the answer you receive is, “I saw the ad on the website.” The person before you may not be trying to crack a poor joke, they may be autistic and answering your question very literally having taken the meaning at face value. You need to be sure that you are asking the right questions if the answers you receive seem odd. 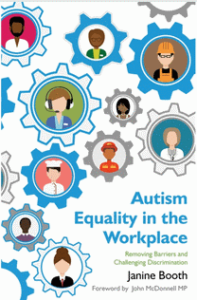 If you are an employer have you thought about how autism friendly your workplace is? Could someone with autism thrive and get on under your management? Would they struggle with sensory issues around noise, lighting and temperature? Are expectations for normalistic communication so entrenched that they would struggle to become a valued member of your team of employees? Many autistic individuals have incredible strengths that many employers would do well to tap into. According to this BBC article some technology companies, including Microsoft, Vodafone, SAP and Hewlett-Packard Enterprise, are active in reaching out and hiring people with autism. It would be great if more companies followed their lead. Janine is also a poet and she finished her presentation with her poem, Manifesto behind the Mask, which she has kindly allowed me to publish. Slow down and answer the question. It is so important to raise awareness about this topic. So many are more aware of autism in general, but cannot transfer it to other situations, like considering someone for employment. Thanks so much for linking with #SpectrumSunday. We hope you join us again tomorrow.